Because they are worth nothing. Think you missed the point. Another one for the WG proof reading fails thread. Wait, I can't trade my ISU-130 in??? Oh for fu... I was hoping that I could at least do something useful with it. P.S. You can trade your T28 HTC in? Come the [edited] on, you can trade a reward tank in but not one that was sold in the shop??? Edited by Darksider267, 22 October 2018 - 03:08 PM. Edited by U12D13, 22 October 2018 - 03:09 PM. It also says that the VK168.01 and KV-2 Ragnarok are tradeable tier 8s. Also, the IS-5 is a tradeable reward, but the Cheftain/T95 and Kreslavskiy aren't? 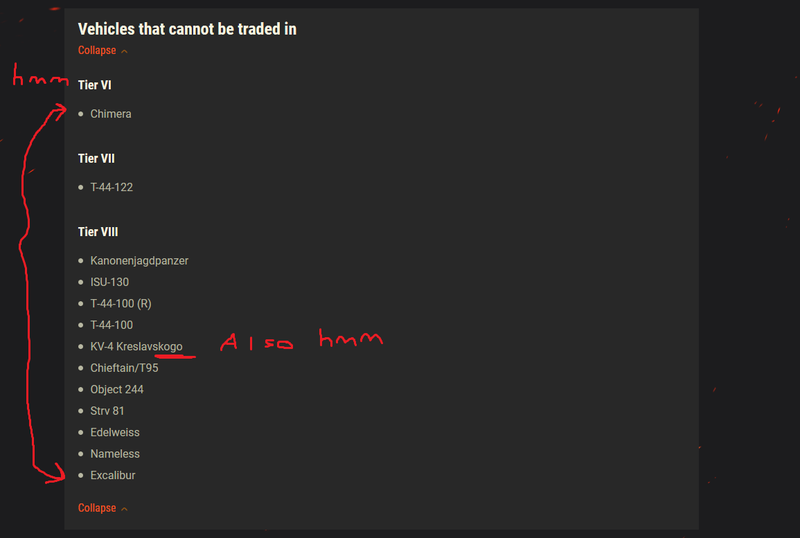 Edit: Im not even going to try to highlight the errors on the list that can be traded in. It's going to take too much effort for the little upboats. Edited by U12D13, 22 October 2018 - 03:18 PM. 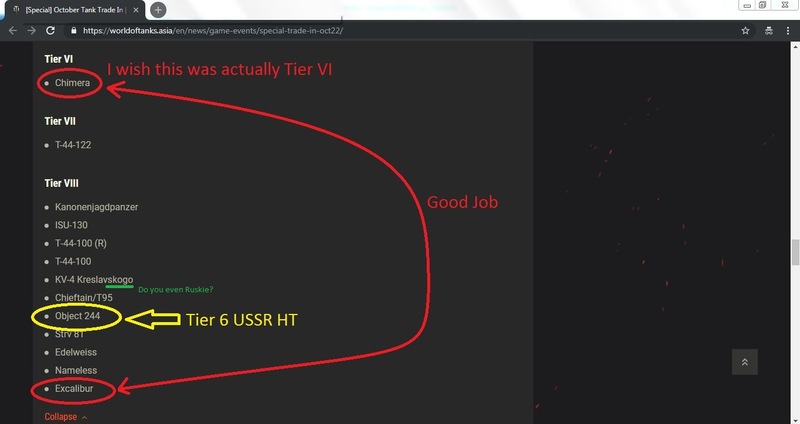 That's because the IS-5 was the Win2Pay reward tank. Edited by Lee_Shawran, 22 October 2018 - 04:33 PM. Edited by neokai, 22 October 2018 - 10:02 PM. Any tech tree premiums worth buying atm? Thinking about Super Pershing and/or STG. It really is noticeable how little there is to pick up if you're not interested in PMM tanks. I want to do a trade-in with my Defender, but that doesn't mean I want to just throw it away. Keeping it for now I guess. Its basically an IS with a 85mm gun. Yeah, how about no. Once or twice is fine. But for them to be able to mess things up this often, it becomes kinda unprofessional. Good idea yea Conan? Increases the number of people actually bothering to read news articles, boosts forum activities and motivates your proofreading hamsters! Not to mention free stuff for the community! Edited by U12D13, 23 October 2018 - 01:34 PM. why upvote, should have asked for a penny from WG each time they made a mistake. With the money you get, it can potentially put you through college.